Well Jojo Moyes has done it again! By that I mean she has made me fall in love with the characters, made me laugh and made me cry. There I was on my sick bed giving into my emotions at a particularly sad part of the tale, when the doorbell rang. Not only had I been suffering with a high temperature meaning I was sweaty, my hair stuck unflatteringly to my head and in my most comfy pyjamas, I then had to answer the door to the DHL man. He looked seriously concerned probably because the red blotches from crying looked even more alarming against my deathly pale skin, so I muttered ‘a virus’ signed on the magic machine and scooted upstairs, straight back to this book. So what is it about? The One Plus One is very different to both The Girl You Left Behind and Me Before You; although the storyline keeps you reading in exactly the same way, the underlying plot is in many ways less defined. This isn’t about war-time or living life as a quadriplegic, there is no ‘big issue’ instead The One Plus One looks at the more mundane, but perhaps because of that, the more significant issue of hope. At its root the story is that of Jess Thomas who is trying to improve the lives of two children, her daughter Tanzie and her step-son Nicky. This book provides a social commentary on many issues covering the core subjects of low income families seemingly fruitless struggle to improve their lives and those of their children, blended families and the way that it isn’t uncommon to live in an unusual mix of relationships as well as the gap in perception between those better off members of society. It also packs fractured family relationships, parental illness and bullying, so there is plenty to get your teeth into! Jess Thomas is one gutsy character, optimistic against seemingly impossible odds, a single mother since Marty left two years previously. She has a cleaning company with her friend, a second job in a pub and a paperback book addiction (all bought from charity shops) and although she adores the children, like so many mothers is so busy working she doesn’t always have time to enjoy them. Ed Nicholls is having women problems, he is also the director of an up and coming software company has two homes and several cars. When Jess meets him while cleaning his home the enmity between them soon becomes apparent but in a strange twist of fate they are forced to spend quite a lot of time together…. This is very much a character based story and the characters Ed, Jess, Nicky and Tanzie all take turns in narrating events. This is one book where this device works well to give a rounded picture of each of their individual personalities. Jess and her family are instantly likeable the depiction of children of that age an authentic one, Moyes hasn’t fallen into the trap of making the teenage Nicky in the mould of the popular cliché, yes he is sullen at times but with good reason, but he is far more like the teenagers who came through the door of my house than many I come across in books. I don’t want to say anything else as I don’t want to spoil the story for all of you who are going to pick it up, but I can’t conclude this review without saying that this is one author who has an unerring eye for detail. She perfectly captures the quirks of human nature and has the ability to tell a cracking story, one that will have you laughing one moment and fighting back (or not bothering if you are poorly) the tears the next. I would thoroughly recommend this one. I received a free copy of this book from Penguin Books UK in return for this review ahead of publication on 27 February 2014. A dual time-line tale set in France during the First World War and London in the present day. Sophie and Liv’s lives are linked by a painting. “Conned any other women out of their valuables lately ?” she says quietly, so quietly that only he will hear it. Will Traynor is a quadriplegic whose life is changed when Lou Clark is employed to help him. This grim sounding story-line is lightened to unrecognisable heights by Jojo Moyes’ expert writing which lightens the mood while sucking you and then Bam! you’re in a sad bit and sobbing…. This is something right up my alley. Thank you for the recommendation. I have heard great things about Me Before You but until now I have not read it. Perhaps this 2014. I do love her books and I have to confess if I hadn’t read The Girl Before You which fell into a genre I love I wouldn’t have picked up the others. All are 5* reads and I have The Last Letter to Your Lover which my friend says I must read! I think you should try one in 2014! Sound so very good. I haven’t read any of her books before, but with so many great reviews, I will definitely pick up one. This one sounds like a good one, should I start with this? what say? You can’t miss this one, just make sure you have hankies at the ready! I’m sorry you haven’t been feeling well–but I had to laugh at your DHL experience! 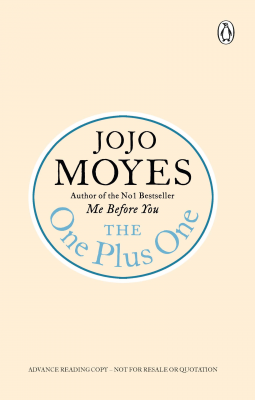 This books sounds great–I think I may be one of the few people left in the world who hasn’t read any Jojo Moyes–I’m going to have to do something about that! His timing was impeccable, he caught me at my most grotty but he was delivering me (another) book! You should try one her ability to tell a good story is amazing and they are all different which is even better. I love Jojo Moyes. I’m halfway through this and I’m absolutely loving it! She does write brilliant stories – Enjoy! Well Cleo, you’ve introduced me to another author that I’ll add to my TBR. Hope you feel better. I really want to read Me Before You. I’ve heard great things. This one sounds pretty good too. I love a great character-focused novel. I loved this too, I loved everything about it. Can’t be anymore specific that that! Great review! I cannot wait for this to be published in the US! It was a brilliant read, perfect for being ill in bed with a nasty virus 😉 I hope it reaches your shores soon! I loved this one too, great review!